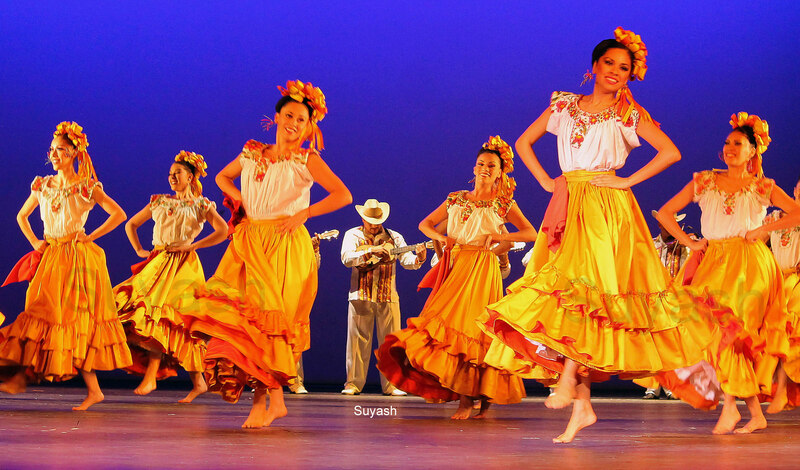 “Dance – that form of expression of human sensitivity which involves the confluence of rhythm, bodily movement and music – is both ancient and deeply engrained in Mexico and its history”. On our second day of our Mexico trip, we chanced upon to see one of the top attractions of Mexico City – Ballet Folklorico de Mexico. In its 60th year, this ballet performance by beautiful dancers, in their colorful attires, and musicians enthralled us with their gyrating moves and foot-tapping music. The renowned ballet was conceptualized and founded by the famous Mexican dancer and choreographer, Amalia Hernandez, who attributed it to the Mexican folklore “which is not just coldly intellectual but rather something full of life”. It was splendid Sunday evening spent at Palacio de Bellas Artes (Palace of Fine Arts), an important cultural hub of Mexico City, which hosts several theatrical performances including this Ballet Folklorico de Mexico. This building in the Mexico City downtown is a magnificent example of architecture with finest murals inside and a art deco – a must visit. You must book the tickets atleast a day in advance, as tickets are mostly sold out on the day of the performance due to many tourists coming. Generally there are three shows in a week, one on Wednesday and two on Sunday (morning and evening) but it is advisable to check the event calendar. When to Visit the Palace: There is a free guided tour of the main theater to see the stained glass curtain from Tuesday to Friday between 1 and 1:30 pm. Otherwise, it is open for visitors everyday from 10 am. How to Reach: It is the heart of the city in the historic downtown. Nearest metro station is Bellas Artes. Enjoy more photos of ‘Yellow’ for this week’s challenge here. More travel blogs on Mexico. This entry was posted in Art & Culture, Events, Mexico, Photography, Travel and tagged Amalia Hernandez, Attractions in Mexico City, Ballet Dance, Ballet Folklorico de Mexico, Mexican Culture, Mexican Folk Dance, Mexico, Mexico City, Palacio de Bellas Artes, Photography, Travel, Weekly Photo Challenge. Bookmark the permalink. I loved this building! Unfortunately, I didn’t even think to see a show but I did wander around the Palacio for about an hour admiring the architecture and art. Next time I’ll have to see a show, though! Its a magnificent building in the heart of historic center. Zocalo is just so amazing architecturally. You must enjoy a show here the next time. It was simply superb. Both myself and my wife loved it so much. Giving an overview of this art form and reflecting your personal experience of being there. Thanks so much Sreejith for your valuable feedback.